I get alot of questions in regards to the donor region and what it looks like after a sizeable FUE procedure. I have posted a few picutres below of some Armani patients where their heads were shaven down really showing off the doner area. Both of the patients had over 4,000 grafts exctracted. 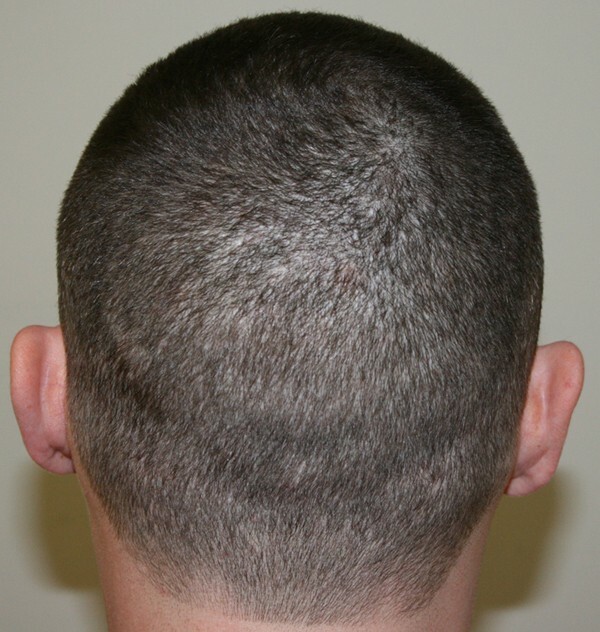 In the first photo the patient had a small strip procedure prior, you can see the strip scar when buzzing down his hair but the fact that the patient had FUE is undetectable. 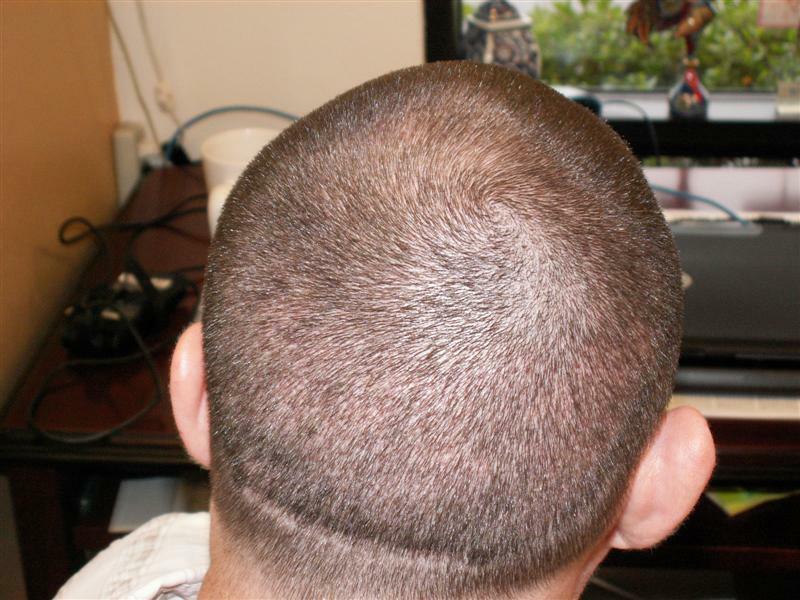 One of the huge benefits of FUE over strip is that the patient has the ability to buzz his hair down still. » the doner area. Both of the patients had over 4,000 grafts exctracted. » the patient has the ability to buzz his hair down still. What was done to his former strip scar? There are some very clear white dots in the closeup photo I am surprised nobody says anything. What size tools does Armani use? » nobody says anything. What size tools does Armani use? I think it depends on each patients hair characteristics etc. I know which I’d prefer to have between a big line across my head or dots. Nice pics. I had 2 fue procedures done with Dr. Armani and when I buzz my hair short no one can tell that I had anything done to my hair. I think one thing to mention is, we all know the patients above had work done so we are LOOKING for scarring. If you asked the average person which of the two patients above had work done, the average person would notice the strip scar and not the guy who had just FUE. » the strip scar and not the guy who had just FUE. Anyone who says there is no scarring is lying. It’s kind of expected, even for fue. The thing with fue is that it is a lot easier to hide the scarring. Well I think in the end if it came down to a choice of someone noticing my receding hairline, which was getting noticable without growing it long, a big line across my head, or the off chance of someone noticing a few dots if I kept it short. The choice is clear. Go FUE. 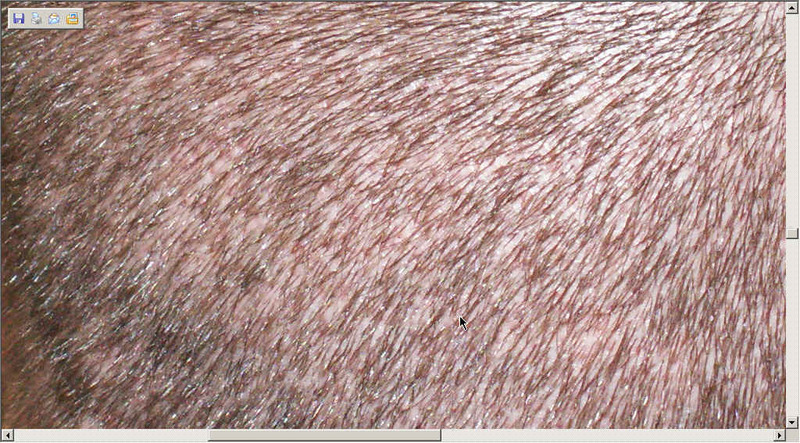 I’ve seen many a strip surgery where even when hair has grown quite long and the scar is still not hideable. I’m quite surprised there are some who still are tossing up between the two procedures. Yes I may be able to notices a dot here or there on my head, but I’ll take that any day over the alternatives. And as Pat mentions, the average Joe isn’t thinking to stare at the back of your head, unless you’ve mentioned something or he/she is your hairdresser. I also can’t tell any difference in the hair density in the donor area either. My clippers still get bogged down a bit because my hair is so thick in the back. I agree. I still don’t see the dots! Are they on the second pic? I think that donor area looks great, especially compared to a typical (even good) strip scar. His hair is buzzed VERY short. #1? Grown out even a little bit, I’ll bet nothing would be visible. Even as is, IMO, no one besides us HT junkies would know what’s up. Considering that there are some good FUE clinics out there showing strip-like yield and minimal scarring, I can’t imagine going strip in 2008. But I’ve had 16 strips so maybe I’m biased. Lol. The one question I do have is would the results be similar with different hair/skin color combinations? » His hair is buzzed VERY short. #1? » Grown out even a little bit, I’ll bet nothing would be visible. » Even as is, IMO, no one besides us HT junkies would know what’s up. » But I’ve had 16 strips so maybe I’m biased. Lol. Woah! You had 16 strips? That’s alot! Good for you though…very brave! More like young and stupid. I’m very lucky not to be a mess. PM me sometime and I’ll tell you my story. Not looking to hijack this thread. Again, nice FUE donor areas. » More like young and stupid. » I’m very lucky not to be a mess. » PM me sometime and I’ll tell you my story. » Not looking to hijack this thread. » Again, nice FUE donor areas. Oh ok. I didn’t realize you would had a bad experience. K…I’ll PM you.